Implementation was supposed to begin in July. The last phase of the Queens Boulevard redesign, which DOT said would begin in July between Yellowstone Boulevard and Union Turnpike in Forest Hills, has stalled — and cycling advocates are worried that the city may renege on its commitment to an already successful street safety project that includes protected bike lanes and other improvements. The Forest Hills segment is slated to be the fourth and final phase of safety fixes on Queens Boulevard, which was once dubbed the “Boulevard of Death” because of the number of fatalities that occurred there before drivers were reined in — 195 between 1990 and 2015. Since DOT begin redesigning the street in 2015 no pedestrian or cyclist has died on it, and one driver was killed. Pedestrian injuries are also down 63 percent along the already completed areas, yet the Forest Hills segment was opposed by Council Member Karen Koslowitz, a few businesses and Community Board 6, which voted 23-11 against the project. One business in particular, Ben’s Best kosher deli in Rego Park, blamed its long-anticipated closure on the bike lanes installed in 2017 — and not, as some critics pointed out, that the restaurant is selling expensive, high fat nostalgia food in a changing neighborhood. But DOT — buoyed by Mayor de Blasio’s commitment to seeing through the multi-year, $100-million redesign — told CB 6 in May and June that it would move forward with the project regardless of the board’s vote. Hannus and others fear that DOT’s inaction on the corridor means it has changed its mind and given in to opponents. The agency has not responded to Streetsblog’s inquiries — today and in August — about what is happening (or, more accurately, not happening) on the stretch. “I do feel like they might just not do it at all, and I don’t know why,” Forest Hills resident Yehuda Pollack said. “It’s not like they put out a statement that said we’re not doing this for these reasons. They’re just not telling. I just crossed Queens Blvd yesterday and saw five cyclists in that crossing (both sides). It’s definitely slowly getting more popular. Ben’s closing isn’t just about the nostalgia food. As the kosher-keeping community in that part of Queens has become more observant, Ben’s continued to use a less stringent kosher supervision, one which was not acceptable to many of those in the local community who keep kosher. It’s just ridiculous how low the bar is for watering down infrastructure. Now that the crosstown lanes have been fully striped for a while, it looks like 26th will not be getting a lane for the 80% of the block between 1st and 2nd as planned. The stub unprotected curbside lane ends at a driveway but was supposed to continue the whole block and would have replaced parking along one side. This is actually one of the most uncomfortable sections of the lane as it is a 2-way section and almost all cyclists need to make a left turn onto the 1st Ave lane. I think this change is due to a single woman in a wheelchair at the CB6 meeting who spoke in favor of retaining parking in the area. I remember her–she used the tried-and-true “I love bike lanes–just not here” trope. I used to avoid Queens like the plague, but just last week I biked the Queens Blvd bike lane for the first time . It’s typical urban biking, not so great to look at, but I felt perfectly safe. I hope they complete that last section. "We obviously are committed to Queens Boulevard," de Blasio tells reporters. 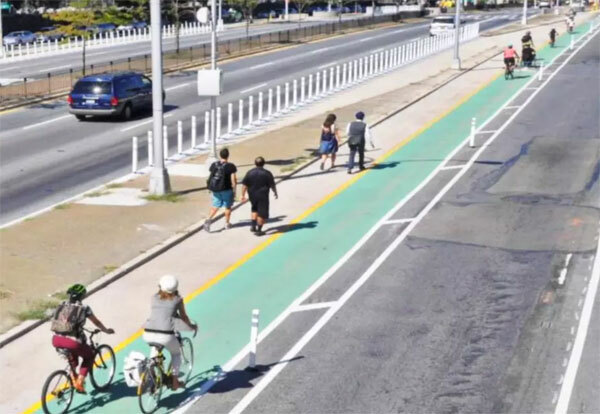 DOT's fourth and final planned phase of the Queens Boulevard redesign will extend bike lanes and pedestrian safety improvements east to Union Turnpike. Cycling on last year's segment is up 127 percent so far in 2018. Last night, the public got a look at the next phase of DOT's Queens Boulevard redesign, which will extend protected bike lanes, pedestrian safety improvements, and traffic calming treatments through Rego Park to Yellowstone Boulevard. The project got a thumbs up from the Queens Community Board 6 transportation committee in a 7 to 3 vote. Traffic injuries dropped 35 percent on the 2.5-mile stretch that DOT first redesigned with more dedicated space for walking and biking.